Could it be the key to sustainable behavior change? Any dietitian who works with clients or patients knows that facilitating lasting behavior change is challenging. One reason is that motivation may wax and wane—or be absent altogether. Acceptance and commitment therapy (ACT) can be a powerful way of helping patients who are struggling to make changes due to ambivalence, resistance, or entrenched nutrition beliefs by focusing on taking mindful action that's in line with personal values. ACT (pronounced "act," not "A-C-T") was developed by psychologist Steven Hayes, PhD, in 1984. Its key message is to accept what's out of your control and commit to action that improves your life. ACT falls under the umbrella of cognitive behavioral therapy (CBT), as does Beck's cognitive therapy—which is what most people mean when they refer to CBT—motivational interviewing, and dialectical behavior therapy (DBT). Lauren Moore, MS, RD, a Denver-based dietitian who specializes in eating disorders, had training in motivational interviewing and counseling, but when she started working at an eating disorder clinic, she hit a wall when trying to help patients find the motivation to change their eating behaviors. "I found myself getting stuck in sessions—I really couldn't make progress," she says. "I couldn't imagine continuing with my career feeling that way. It just wasn't sustainable for me." Moore started exploring ACT by reading The Happiness Trap: How to Stop Struggling and Start Living: A Guide to ACT by psychotherapist Russ Harris, MD. "I made a commitment to do it for myself, for my psychological flexibility," Moore says. 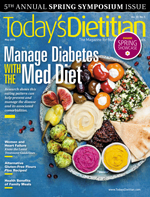 "Dietitians can be rigid and clinical, using one side of their brain." She says ACT helped her become aware of where she was getting stuck and unable to effectively motivate patients to make lasting changes to their eating behaviors for long-term health during sessions, which in turn helped her see where her patients were getting stuck. "For me, it just clicked. ACT for me is a way to meet a client where they're at." • Contact with the present moment ("Be Here Now"): Consciously paying attention to the here-and-now experience instead of drifting off into thoughts or operating on "automatic pilot." • Defusion ("Watch Your Thinking"): Learning to "step back" and separate or detach ("defuse") from thoughts, images, and memories, watching them instead of getting tangled up in them. • Acceptance ("Open Up"): Making room for painful feelings, sensations, urges, and emotions instead of fighting them, resisting them, running from them, or getting overwhelmed by them. • Self-As Context ("Pure Awareness"): Flexible perspective taking, or seeing the difference between your thoughts and the part of your mind that notices your thoughts. • Values ("Know What Matters"): Clarifying what truly matters in the big picture. • Committed Action ("Do What It Takes"): Taking effective action, guided by personal values. Is ACT Within the RD's Scope? Moore says she's open to using ACT and has never had a therapist say she was overstepping bounds—although some dietitians have. "I don't know why we put ourselves in a box or are so afraid that we're going to step on other people's toes," she says. "I think we should all be using the same therapeutic techniques [including ACT], or at least know what's happening even if we don't feel comfortable actually using them." "As long as dietitians have some training and know how to use the skills, I think it's great to use ACT," says Angela Izmirian, PhD, a psychologist at Portland (Oregon) Psychotherapy Clinic, Research and Training Center. "Most people can look up how to eat right; most people know that they need to exercise. They don't do it usually because of thoughts and feelings that are triggers." Judy Simon, MS, RDN, CD, CHES, owner of Mind-Body Nutrition in the Seattle area and a clinical instructor in the University of Washington's nutritional sciences program, says that any dietitian who works with groups or individuals in behavior change around relationships with food and eating needs to be grounded in all the evidence-based therapies. "Would I evaluate a patient and say, 'I'm going to use ACT'? Not necessarily, but if I understand those tools I can pull from them. And if their therapist was using it, I could support the treatment and use some of the same language." Izmirian agrees that this kind of partnership is beneficial. "It would be helpful to say to a dietitian, 'What we're working on is defusing from these thoughts,'" she says. (Defusion from thoughts is one key principle of ACT.) "Then the dietitian could ask the patient what tools they learned from their therapist about how to defuse from thoughts that are holding them back from making changes." Research shows that intuitive eating—a form of internally regulated eating—and ACT work well together,5,8,13,14 and Simon points out that intuitive eating is another example of a technique that both dietitians and therapists can share. "These are really cross-professional tools. The more we do together, the better," Simon says. "The more we can understand and use these tools, the more we can help patients get out of stuck places." "I feel like values are one of the most important parts of ACT," Izmirian says. "If you're doing this diet or exercise plan because you want to lose weight, that's not very motivating, but if you say that this is for health because you want to be a better parent, that's motivating. You don't have to be an ACT therapist to talk about values." Values are like a compass, in that they provide direction and help someone stay on track. The idea of ACT is to help patients move mindfully, skillfully, purposefully, wisely, and flexibly towards their values-driven goals.6 Goals are what we want to have; values are how we want to live. For example, good health is a goal, while self-care is a value. Values are something a patient can live immediately, before they ever reach their goal. "Values is something I talk about a lot," Moore says. "'If you were to make a decision, which choice is moving you closer to your value system; which one gets you closer to what you want?'" Moore adds that while some patients start out motivated to change, at some point most people get stuck on one thought story line—they become psychologically inflexible. ACT is a perspective technique, Moore says. It's useful for helping patients zoom out from any inflexibility they're experiencing so they can see the big picture. Moore recommends dietitians use ACT on themselves first, especially if they feel uncomfortable with using it. She says the workbook Get Out of Your Mind and Into Your Life: The New Acceptance and Commitment Therapy by Steven C. Hayes, PhD, is particularly useful. "Only if you can understand it for yourself and how it plays out in your own life can you apply it in session." ACT Made Simple: An Easy-to-Read Primer on Acceptance and Commitment Therapy by Russ Harris is another excellent resource for clinicians. 1. Cattivelli R, Pietrabissa G, Ceccarini M, et al. ACTonFOOD: opportunities of ACT to address food addiction. Front Psychol. 2015;6:396. 2. Zhang CQ, Leeming E, Smith P, Chung PK, Hagger MS, Hayes SC. Acceptance and commitment therapy for health behavior change: a contextually-driven approach. Front Psychol. 2018;8:2350. 3. Kashdan TB. Psychological flexibility as a fundamental aspect of health. Clin Psychol Rev. 2010;30(7):865-878. 4. Forman EM, Butryn ML. A new look at the science of weight control: how acceptance and commitment strategies can address the challenge of self-regulation. Appetite. 2015;84:171-180. 5. Boucher S, Edwards O, Gray A, et al. Teaching intuitive eating and acceptance and commitment therapy skills via a web-based intervention: a pilot single-arm intervention study. JMIR Res Protoc. 2016;5(4):e180. 6. Harris R. ACT Made Simple: An Easy-to-Read Primer on Acceptance and Commitment Therapy. Oakland, CA: New Harbinger Publications, Inc; 2009. 7. A-Tjak JGL, Davis ML, Morina N, et al. A meta-analysis of the efficacy of acceptance and commitment therapy for clinically relevant mental and physical health problems. Psychother Psychosom. 2015;84:30-36. 8. Järvelä-Reijonen E, Karhunen L, Sairanen E, et al. The effects of acceptance and commitment therapy on eating behavior and diet delivered through face-to-face contact and a mobile app: a randomized controlled trial. Int J Behav Nutr Phys Act. 2018;15(1):22. 9. Fogelkvist M, Parling T, Kjellin L, Gustafsson SA. A qualitative analysis of participants' reflections on body image during participation in a randomized controlled trial of acceptance and commitment therapy. J Eat Disord. 2016;4:29. 10. Lillis J, Kendra KE. Acceptance and commitment therapy for weight control: model, evidence, and future directions. J Contextual Behav Sci. 2014;3(1):1-7. 11. Lillis J, Niemeier HM, Thomas JG, et al. A randomized trial of an Acceptance Based Behavioral Intervention for weight loss in people with high internal disinhibition. Obesity (Silver Spring). 2016;24(12):2509-2514. 12. Forman EM, Butryn ML, Manasse SM, Crosby RD, Goldstein SP, Wyckoff EP, Thomas JG. Acceptance-based versus standard behavioral treatment for obesity: results from the Mind Your Health randomized controlled trial. Obesity (Silver Spring). 2016;24(10):2050-2056. 13. Sairanen E, Tolvanen A, Karhunen L, et al. Psychological flexibility and mindfulness explain intuitive eating in overweight adults. Behav Modif. 2015;39(4):557-579. 14. Sairanen E, Tolvanen A, Karhunen L, et al. Psychological flexibility mediates change in intuitive eating regulation in acceptance and commitment therapy interventions. Public Health Nutr. 2017;20(9):1681-1691.